As the summer season begins, the number of homes sold has not slowed down. In fact, the housing market is hotter than ever. According to the National Association of Realtors, home sales for May 2013 were up 12.9% compared to last year, making this the 23rd consecutive month gain. 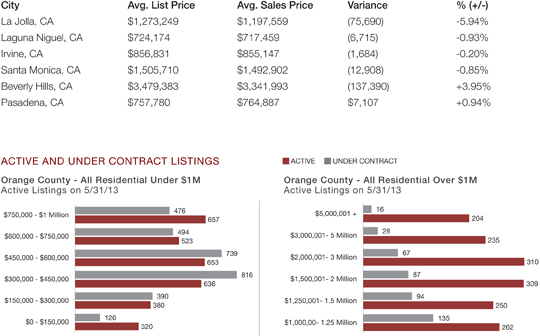 San Diego based DataQuick, reports the median existing-home price in California at $340,000 for May 2013, a 4.9% increase from the previous month. Additionally, for the first time in seven years, the National Association of Home Builders (NAHB) monthly sentiment index increased eight points last month. The increase in home builder sentiment now means more builders view sales conditions good rather than poor, adding more strength tot he housing market. With many signs that the recovery in the U.S. property market has taken root, many buyers are considering a home purchase now before home prices and mortgage rates rise further. Low interest rates have created a larger pool of buyers, which has increased home prices. With home builder sentiment on the rise and more building permits approved, now may be the best time to sell.